The History of Christmas: The tradition of celebrating Christmas on December 25 dates back to the Roman Empire in 336AD. Its customs and traditions were heavily influenced by ancient pagan traditions mixed with various early European religious celebrations. The Origin of Christmas: Pagan festivals became integrated with Christian celebrations and a mixture of the traditions associated with Christmas evolved. The Winter Solstice and the ancient pagan Roman midwinter festivals called 'Saturnalia' and 'Solis Invictus' took place in December and the first recorded date of Christmas being celebrated on December 25 was in 336AD, during the time of the first Christian Roman Emperor Constantine (c280 - 337AD). A few years later, Pope Julius I, the bishop of Rome, officially declared that the birth of Jesus would be celebrated on December 25. Definition of Christmas: Christmas is defined as a Christian holiday and annual church festival held on December 25 celebrating the birth of Jesus Christ. Christmas is celebrated by giving special gifts, greetings, and providing hospitality for family and friends. The word Christmas derives from the late Old English 'Cristes maesse' meaning "Christ" and "mass". Fact 1 - History of Christmas: The birth of Jesus was so important to Christians that people wanted to celebrate and remember this special time. The problem was that nobody knew the exact day and date that Jesus was born, nor whether Jesus was born in the winter or the summer. Fact 2 - History of Christmas: At the time in history when Jesus was born there no accurate records were kept relating to births and birth certificates did not exist. Fact 3 - History of Christmas: Someone had to make the decision of when this momentous event should be celebrated. 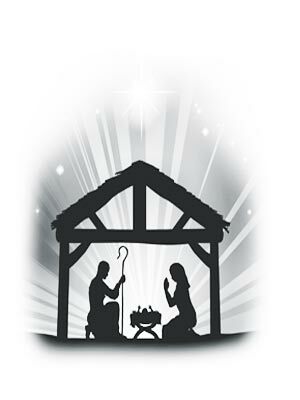 This article contains the history of how Christmas began. Fact 4 - History of Christmas: Jesus was born in Judea (now Palestine) during a time of great turbulence when the Roman Empire (27 BC - 476 AD) had conquered half the lands of the known world encompassing all the lands of the Mediterranean, north-western Europe and the Near East. Fact 5 - History of Christmas: We know exactly where Jesus was born due to words of the Bible. The gospel of Matthew states that "Jesus was born in Bethlehem of Judea in the days of Herod the king." Luke 2:1-7 describes his parents, Joseph and Mary, as both being residents of Nazareth in the Galilee. But there is no mention of a date of birth. Fact 6 - History of Christmas: The history of Christmas is a combination of old Pagan observations and traditions merged with new customs when Christianity become the official religion of the Roman Empire. Fact 7 - History of Christmas: The seven day Roman public holiday of Saturnalia (December 19 to December 25), celebrated to honor the Saturn the god of agriculture and liberation, was observed at the winter solstice. The festival of Saturnalia was highly anticipated as an excessive and fun-filled event in which lavish feasting, the exchange of gifts, practical jokes and the decoration of trees were strongly featured. Fact 8 - History of Christmas: Saturnalia also included events relating to liberation and freedom. Serious matters were barred and no businesses were allowed to open during the festivities. Controlled levels of freedom and license were given to slaves including the reversal of social roles such as with masters and slaves. The festival of Saturnalia often got out of hand and Emperor Caligula (AD 12-41) sought to restrict it to five days, but with little success. Fact 9 - History of Christmas: The Romans had historically celebrated the December 25 as the shortest day of the year, the day when there is less sunlight than on any other day. On the shortest day of the year Romans began to worship a new sun god called Sol Invictus by kindling lights in token of festivity together with prayers and offerings to ensure that the sun returned to give them a good summer. Fact 10 - History of Christmas: The cult of Sol Invictus, the official sun god of the late Roman Empire, was introduced into the Roman Empire in AD 274 by Emperor Aurelian (214-275), who effectively made it a state religion. Another Winter Solstice festival was introduced called the 'Dies Natalis Solis Invicti' meaning "Birthday of the Unconquered Sun". However, many Romans clung to the old ways and elements of the Saturnalia festival were amalgamated into the new cult. Fact 11 - History of Christmas: Other cultures such as the Celts, Saxons and Vikings also held celebrations at the time of the Winter Solstice. The Viking god Thor was honored with festivals of feasting, drinking, and dancing with sacrifices and religious rites. It was called Yule, or Jul, and held in anticipation of the return of the sun. Yuletide customs included decorating halls with evergreen boughs such as holly and mistletoe, a form of pagan tree worship, and the burning of a massive Yule Log. The Yule log was cut from an Oak tree, the symbol of the god Thor. Fact 12 - History of Christmas: The Roman Empire was built on the amalgamation of new and old religious beliefs and adapting the ideas and history of other cultures. The combination of different beliefs and the blending of religious practices is known as Syncretism. Roman Syncretism involved the merging, or assimilation, of traditions to assert new beliefs with an underlying unity and acceptance of old beliefs and customs in order to pacify people and maintain the power of the Roman Empire. Fact 13 - History of Christmas: The tradition of Roman Syncretism helped with the Christianization of the whole of the Roman Empire. The only man with the power to instigate such a change was the Roman Emperor. The Emperor Constantine (c280 - 337AD), who became the first Christian emperor, was brought up in the Sol Invicta cult. His conversion to Christianity began with a vision seen by Constantine during a military campaign in Gaul. The Emperor Constantine proclaimed that, aided by the divine power of God, he had come to bring peace and prosperity to all lands. Fact 14 - History of Christmas: In 313 the Emperor Constantine issued the "Edict of Milan," which granted official toleration of Christianity and other religions. Constantine did not make Christianity the official religion of the empire and condoned both Christianity and paganism during his reign. Fact 15 - History of Christmas: The first recorded date of Christmas being celebrated on December 25 was in 336AD, during the reign of the first Christian Roman Emperor Constantine (c280 - 337AD). In 354AD, Pope Julius I, the bishop of Rome, officially declared that the birth of Jesus, Christmas, would be celebrated on December 25. Fact 16 - History of Christmas: Three Roman Emperors, Theodosius the Great, Gratian and Valentinian II, issued the Edict of Thessalonica (also known as Cunctos populos), on February 27, 380 AD ordered all subjects of the Roman Empire to profess to the Christian faith and made Christianity the state religion of the Roman Empire. Fact 17 - History of Christmas: The celebration of Christmas became one of the most important Christian festivals but the Romans, adhering to their policy of Syncretism, allowed old Pagan observations and traditions to merged with new Christian celebration of Christmas. Many of these old customs and traditions still linger in modern Christmas celebrations. Fact 18 - History of Christmas: Evergreens such as holly and mistletoe are still used to decorate homes at Christmas. Christians regard holly as a symbol of the "crown of thorns" and that the berries turned from white to red after the crucifixion. Mistletoe symbolizes renewal reflecting the resurrection of Jesus Christ. Fact 19 - History of Christmas: The tradition of giving gifts at Christmas still remains, symbolizing the gifts of Frankincense, Gold and Myrrh given to Jesus by the Wise Men. Fact 20 - History of Christmas: Saint Nicholas who was born c. 270 in Patara, Lycia, Turkey and died on December 6 346 is closely associated with Christmas. Saint Nicholas was known for his generosity, gift-giving and his kindness to children. The Feast of Sinterklaas, or St. Nicholas, is celebrated by the Dutch and in America 'Sinterklaas' developed into the name of Santa Claus. The legends surrounding Santa Claus and the association with Christmas, were elaborated in the famous poem 'T'was the night before Christmas' written by Clement Clarke Moore in 1822. Fact 21 - History of Christmas: The twelve days of Christmas, known as Christmastide, start on December 25 and end the evening of the Twelfth Day of Christmas, on January 5. During the Medieval era and the Renaissance period, the 12 Days of Christmas consisted of great celebrations with continuous feasting and merrymaking, which climaxed on Twelfth Night. Many of the old Roman customs of the Saturnalia festival were reflected in the Christmas revels including the reversal of social roles in which Lord of Misrule, or the Master of the Revels, who took on the guise of the king creating havoc with preposterous pranks and orders. Fact 22 - History of Christmas: The early Christians celebrated Christmas in what was then called the Feast of Lights. In this early Christian Christmas festival a Yule log was burnt to symbolize the end of the world's darkness and the rebirth of Jesus Christ as the light of the world. Fact 22 - History of Christmas: Christmas is celebrated by over 2275 million Christians, but Christmas is also celebrated by many non-Christians as a secular festival. The History of Christmas provides an interesting insight into the customs and traditions of this festive season. If you are interested in the traditions and customs of Christmas you might enjoy reading about Santa Claus and the History of Halloween.